Mesquite has one of the nicest black fleeces in the industry with amazing crimp, handle and density. This black fleece is truly unmatched. We are excited to see his genetic impact on our herd, imagine what he could do to yours. Breedings are limited. 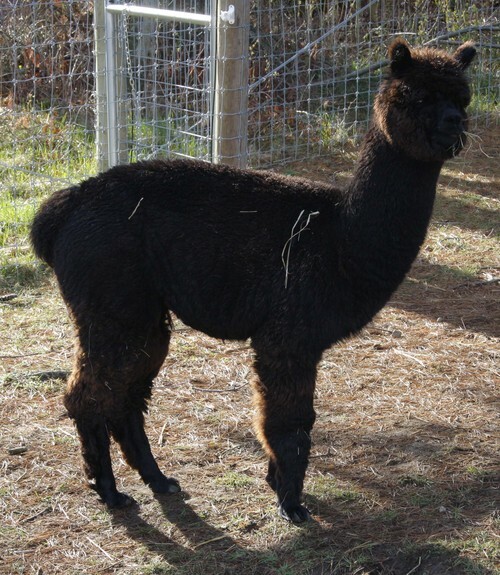 Halle is a gorgeous, dense, perfectly conformed daughter of Camelot's Challenger and producer of exquisite cria - BPA's Trinity. With Don Julio, Hemingway, PPeruvian Felix and 5Peruvian Camelot in your pedigree...you can't help but be a beauty! Halle is that..and more! A beautiful TB Mesquite daughter out of our exquisite TB Challenger daughter..Mystique is a solidly built little powerhouse..both physically and genetically...fine TB fleece and perfect conformation all tied together in this bundle of True Black. Mystique comes with 2 breedings to a Mountain Meadows Farm herdsire!